Edgar Rice Burroughs, Inc., 9781945462139, 262pp. An all-new science fantasy adventure novel by the acclaimed coauthor of the Ancient Opar series, Christopher Paul Carey. Hailed by author and science fiction scholar Richard Lupoff as a "masterpiece of science fiction" and a "pioneer work of the modern school of social extrapolation in science fiction," Edgar Rice Burroughs' classic lunar trilogy-The Moon Maid, The Moon Men, and The Red Hawk- tells the generational tale of humanity's fight for freedom against alien conquerors from the Moon. The hero, Julian, finds his soul perpetually reincarnated in the bodies of his successive grandsons, fated to confront-down through the centuries-the vicious Kalkars who have subjugated Earth. 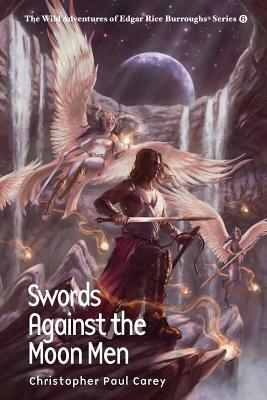 The epic saga continues in this novel, Swords Against the Moon Men. In 2076 AD, Earth has been conquered and humanity brutally enslaved under the cruel tyranny of the Kalkar invaders whose evil was spawned from Va-nah, the Moon's hollow interior. Julian 7th-descendant of the great hero who led the first expedition to Va-nah and nearly defeated the Kalkars-receives a mysterious transmission from the planet Barsoom. The desperate plea from the Red Planet swiftly hurls Julian upon a lonely quest into the heart of Va-nah where he teams up with an U-ga princess and a fierce alien quadruped, and launches a daring rescue to save a lost Barsoomian ambassadorial mission. The success of this mission depends on an unlikely alliance with the Warlord of Mars to assail the enemy's impregnable stronghold. If Julian fails in this quest, humanity-and the entire solar system-will never escape the iron grip of the Moon Men.